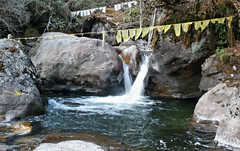 A trip to the remote and less visited places in Bhutan. The tour is completely customized for the interests of the participants, weather/road conditions and special events to be a completely fun and educational experience for both first-time visitors to Bhutan or for those who have seen the usual places already. Drakarpo monastery on a cliff where you find caves, footprints, where Guru Rimpoche meditated in the 8th century. A short drive above the Paro valley and a walk up and around a cliff, the holy cave and a temple, visiting the interesting places and views of the area. On the way down we also see Eutok gompa which was restored recently to fix earthquake damage. 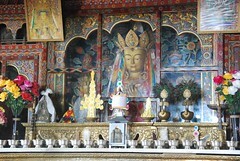 It houses many relics of the founders of this place and has a young new principal lama who is keen to show visitors the refurbished monastery. Continue to Sang Choekor monastery high above the Paro valley. Several temples and a monastic school are found here, so we can visit and hike to several of these to about 10000ft (3000m) above sea level. Hike from Sang Choekor Buddhist College to Yak pasture below Bumdra Monastery (3,800 m). Hike takes you up into fresh mountain meadows with views of the snowy Himalayan mountains. 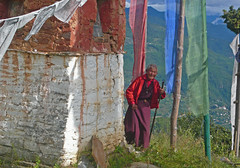 Rinpun gompa is a short hike above the monastery where only a few old people live for meditation and to act as custodians. 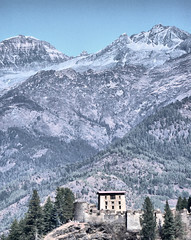 Drugyel dzong was built centuries ago to protect Bhutan from Tibetan invasion. It is only 30 km from the border. It burned down in the 1950's and not restored. It is in a spectacular location below high peaks and has a medieval feel to it. A favorite spot for the locals to visit and have a picnic here. 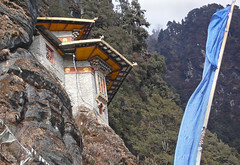 Tiger's Nest monastery was built on the spot where Guru Rinpoche meditated in the 8th century. Paro Taktsang monastery is located 10 km to the north of Paro and hangs on a precipitous cliff at 3,120 m on the right side of the Paro Chu. The rock slopes are very steep and the monastery buildings are built into the rock face. A drive to Chele La Pass which, at 3,988m, is the highest road pass in Bhutan, snaking upwards through blue pine and rhododendron forests for 35 kilometers. On a clear day the view sweeps away to the snow-dome of Bhutan’s second highest peak, Mt Jomolhari (7314m), and down to the Haa Valley. The Haa valley has a simple traditional life with yak pastures over the open ridges leading to Tibet. Hiking along the ridge, we reach a sky burial site (4200 m). Kila nunnery is located just below CheleLa, a temple and houses are built into an overhanging cliff face. Some 75 nuns of all ages live here in a harsh environment at 12,000ft. Dobjey dzong is located near the confluence of 2 rivers - it is on a steep cliff, was built as a prison originally where death sentences were carried out by throwing inmates off the cliff. On the way to Thimphu we will travel up the narrow Gida valley which leads us to the hidden valley of Tselung Nye where Guru Rimpoche rested and left some interesting artifacts in the rocks. Here we find a small temple, meditation houses, a cave used for meditation, a medicine pill and holy water for long life, footprints and various signs in the rocks. You see Chumphu Nye above you atop a hill on your left. Hiking time 4 - 6 hours to visit the small pond and waterfall above the temple, and do a loop down the cliffs to visit caves and a large waterfall. The temple contains a floating statue of Dorji Phamo. 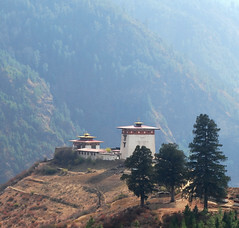 Thimphu area has access to several valleys where important monasteries are located. These include Dorjidra, Tango, Chedri, Droley, Phajoding and Dechenphu monasteries. These are reached by hiking 2 - 4 hours usually at altitudes up to 3500 meters. 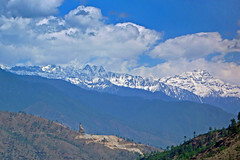 From Thimphu we travel over the 3200 meter DochuLa pass where views of the Himalayas of the Tibetan border can be seen. In April the forests are full of blooming rhododendron trees, with pink, white and red flowers. Below the pass is a small village of Hontsho, where life is mostly unchanged, families cultivate fields of potatoes, radishes, cabbage and other vegetables. Ancient mud-walled dwellings are seen in various states of decay. The Punakha valley is far below, where we visit several monasteries and a nunnery. Nalanda monastery has a large monastic school, teaching Buddhist philosophy and English as well. Monks spend each afternoon practicing debate in the courtyard. From Punakha valley we can reach the mountains of the Gasa area on a new road up the valley of the PoChu river. Along the way we can do a jungle hike to a hidden holy lake, Hokatsho. This is rarely seen by outsiders, and is reached from small villages above the valley floor. This large lake is great for picnics and locals make offerings of money floated on small trays on the river. The next point of interest in the valley is located on the other side of the river, reached by another hour of driving to a small village of farmers. From here a hike of at least 1 hour will get us to Gensephu nye. A small temple is carved into huge rocks and pilgrims visit caves where one can squeeze through small openings to purify sins. Large ancient paintings of gods and godesses are visible on the boulders next to the temple. The meadows below are used as pastures for horses and cows, with a view to the snowy peaks above Gasa. Several hours of driving is required to reach the end of the rough road at Gasa dzong, a majestic spot high above the steep canyon ringed by rocky peaks. The small village was quite isolated until recent years. It is also the gateway to the high plateau where Layans live, tending their horses and yaks. In winter Laya is covered in deep snow, forcing villagers to descend to Gasa and Punakha. The famous Gasa hot springs provide winter relief to the older people who suffer from arthritis and other ailments. Another hidden valley is accessible by a long drive from the Wangdi area. Belandra nye is located up at the end of the valley. The temple is built into a cliff face just like Tiger's Nest, but the hike will only take just over 1 hour from the end of the road.